2013 SYLVAN PONTOONStock #: I15558369VIN #: SYL42364H213Damage Description: FLOODDrive Train:Engine:Transmission: 0Title: CLEARMileage: MilesEconomy:Fuel Type: OtherWarranty: AS ISRuns/Drives: Runs & Drive 2013 SYLVAN MIRAGE 8522 LZ THEFT RECOVERY CLEAN TITLE NO DAMAGE MINT CONDITION OFFERED ONLY $20,500 BUY NOW “Sylvan Marine traces its history back to the late 1940s, when it was founded as a pontoon and houseboat manufacturer near Sylvan Lake in Wolcottville, Indiana. Today, the Sylvan brand is part of the Smoker Craft Family…” with manufacturing facilities in New Paris, Indiana. 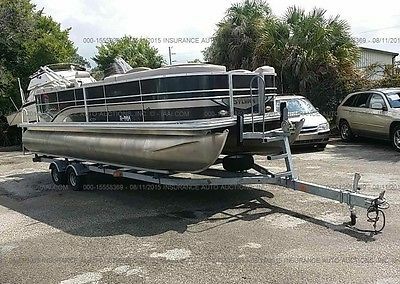 For 2013, Sylvan offers an incredible thirty models of pontoon boats from nineteen to twenty-seven feet in four series from the luxuriously appointed Mandalay series through the Signature to the more basic Mirage Cruise series to the versatile Mirage Fish series. 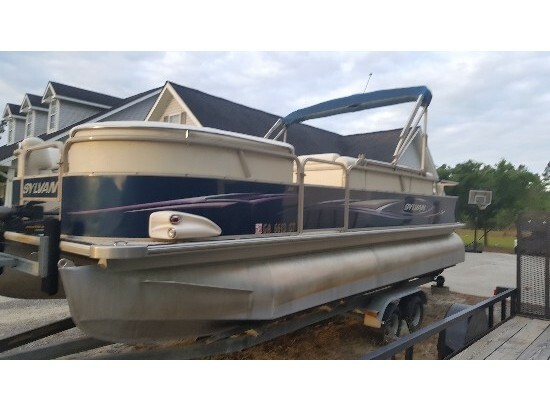 The Mirage Cruise 8522 LZ at 23’10” long on a full 8’6” beam is the second largest in this series and offers basic but very comfortable cruising amenities and is rated for a maximum carrying capacity of twelve persons or 2200 pounds. 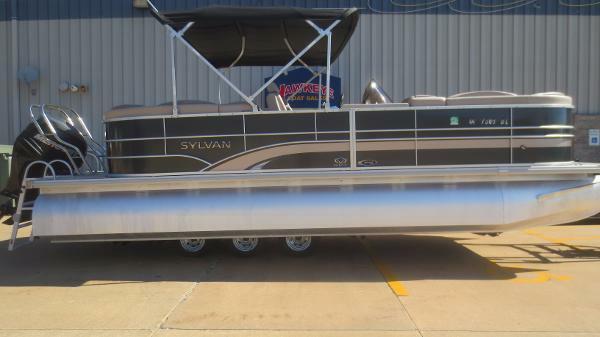 As with all Sylvan pontoon boats, it is constructed, in Sylvan’s words, with “Exclusive Cross Channel Construction features heavy-duty hat channels double through-bolted to the deck risers. Deck and Floor features 3/4" 7-ply pressure-treated plywood through-bolted and screwed to the hat channels. Lifetime limited warranty. Spacers between the fence bottom and the deck allow water to drain easily and cut drying time in half. Fencing is foam-backed to prevent rattling and reinforced for added strength. Gate construction offers the safety of pinch-proof protectors and Posi-Lock® latches. Stainless steel safety rails are used exclusively for increased strength and reliability. Powder coated railings provide a clean look and feel.” This particular model comes standard with two, .080” gauge round pontoon “tubes.” Depending upon your cruising needs in terms of normal loading capacity, rough water boating, or speed requirements for watersports, etc, you may wish to upgrade to a third centre tube, add lifting strakes to those tubes, or go all the way with Sylvan’s Revolutionary Planing Technology (RPT) tube design with Vshaped tubes which, in Sylvan’s words, provide “increased top speed per horsepower and dramatically improved fuel efficiency.” The addition of a third tube raises the maximum horsepower rating from 150 to 200. As with all Sylvan, Starcraft, and Smoker Craft boats in the family, its boats come with a limited lifetime warranty on hull and structure plus a 6-year warranty on all components, carpet, upholstery, and electronics. All parts and labour are included in this warranty and it is transferrable to a second owner. Sylvan refers to this particular model as a “Sunbathers Delight.” “Lounge your days away on the water in the Mirage Cruise 8522 LZ. You and your friends can enjoy those days under the sun relaxing in one of four beautiful premium loungers or jump on out and use the convenient rear entry ladder to enjoy your favorite sports on the water.” And let there be no doubt that virtually every bit of floor space is dedicated to seating. It has two facing loungers in the bow section, a complete wrap-around U-shaped lounge in the stern section with a removable centre section to accommodate a centre rear gate leading to the aft deck. Amidships are the starboard side driver’s consoles and swivel helm chair with slider and armrests and a similar passenger chair opposite on the port side immediately behind the side entry gate. A bow entry gate separates the two bow lounges. The beauty of this Mirage Cruise 8522 LZ is that it comes equipped with the basic standard necessities, but you can then option it up to your heart’s content with only those particular items you want from a very long and complete list of possibilities. Let’s explore that list. On the floor, 22-oz. sculptured carpet is standard or you can opt for 28-oz. carpet or vinyl flooring with or without snap-in carpet. A custom molded helm console with windscreen and basic gauges are standard and you can add a full complement of gauges such as speedometer, volt meter, trim, depth gauges and hydraulic steering too. Stereo and docking lights are standard and add underwater, under deck, and floor lighting. A change room is standard and add the porta potti. Tables with two floor bases are standard; add a second table and floor base. Bimini tops are standard and add a full complement of canvas options. Rear entry boarding ladders is standard, but choose to add a swim platform or you may even choose a The Sylvan Mirage 8522 comes in two different versions, with only slight changes to the layout differentiating between the CR and LZ versions. Our time onboard the LZ version showed her to be a comfortable boat in brisk chop and forgiving in sloppy conditions generated by 20 mph winds. It is not often we test boats in winds that high but with her Revolutionary Planing Technology (RPT) tubes we stayed comfortable and dry at speed.Key FeaturesCustom molded consoleFuel gaugeTachometerWindscreenAll aluminum transom with lifetime warranty22 oz sculptured carpet3/4" plywood deck with lifetime warrantyHelm chair with swivel, slide and armrestsLounge arm change roomAM/FM stereo with auxiliary port for MP3 player8'6'' Bimini topSpecificationsSylvan Mirage 8522 LZ (2013-) SpecificationsLength Overall23' 10'' 7.26 mDry Weight2,295 lbs. 1,041 kgBeam8' 6'' 2.59 mTested WeightN/ADraftN/AFuel Cap30 gal. 114 LDeadrise/TransomN/AWater CapnoneMax HeadroomopenBridge ClearanceN/APrices, features, designs, and equipment are subject to change. Please see your local dealer or visit the builder's website for the latest information available on this boat model. Engine OptionsSylvan Mirage 8522 LZ (2013-) Engine optionsStd. PowerNot AvailableTested Power1 x 150-hp Evinrude E-TEC Evinrude engines have evolved to the point where there’s so much science involved that the real bene...Opt. Power1 x 150-hp Evinrude E-TEC 150 Sylvan Mirage 8522 LZ (2013-) Captain's Report By Capt. Steve-- Mission Statement The mission of the Sylvan Mirage 8522 LZ is to provide a comfortable and luxurious pontoon boat at a cost-efficient price point. She's offered in two versions, with slight modifications to the seating layout differentiating between the two. With her RPT toon design she gets on plane fast which should appeal to watersports enthusiasts. The Sylvan Mirage 8522 LZ. The Sylvan Mirage is an open and inviting boat with a comfortable layout. Distinguishing Features • Four Admiral’s Chairs. These chairs are as comfortable as can be because they swivel and even recline. The armrests are self leveling. Some boats have one or two, but we rarely see four. • Painted Fencing. We typically see panels that are fixed with decals to add highlights. These are actually painted and offered in a choice of four colors. • All Aluminum Transom. This is a departure from the extended pressure-treated wood platforms, mostly covered in carpet, that we normally see. • Standard Docking Lights. There are few things in boating more restful than a sunset cruise on an inland lake in the summer. And its nice to see the approaching dock when coming home. • RPT Tubes. Sylvan calls this Revolutionary Planing Technology and it not only offers quicker times to plane, but the Mirage gets up on plane from a level attitude. The tubes also have a 20-degree deadrise to a hard chine on both sides of the toon, much like a deep-V monohull or the pontoons on a sea planes, which usually have a 24-degree deadrise. • 6-Year Warranty. Sylvan offers a 6-year warranty on all components from stem to stern. Its toons and marine plywood deck are warranted for a lifetime and are transferrable to a second owner, according to the company. Even on our choppy test day, the Mirage manages to keep the spray down low providing a dry ride. Tube Construction Pontoon construction is moving more and more into an advanced area providing boats with more sportboat-like characteristics. The design team at Sylvan call their design RPT for Revolutionary Planing Technology and they seem to have an interesting, and effective take on how it's done. The tubes are 25” (63.5 cm) across with flat sides. The bottom takes on the contour of a V-hull sportboat with flat chines and, what could accurately be described as a 20-degree deadrise bottom. There's even a keel at the bottom to aid in tracking. The bottoms of the tubes are reminiscent of a V-hull boat, complete with chines and keel. The engine mounting pod is even more characteristic of a boat hull with a vertical stem and sharp entry and a bottom that gets lower as the design moves aft. There are even two planing fins with beveled outer edges mounted to the sides. Lifting strakes are added to the front of the tubes. The pod unit that the engine is mounted to has a descending keel, lifting wings and a sharp entry. There is nothing on the market quite like it. The tubes are two piece with a single seam down the center. Tubes are mounted to the deck with “M” brackets for solid support. The corners of the deck are protected with a stainless guard to absorb impact against the dock. Each has non-skid for boarding as well. Performance The Sylvan Mirage 8522 LZ has a LOA of 23'10" (7.26 m) and a beam of 8'6" (2.59 m). With an empty weight of 2,295 lbs. (1,041 kg), 30 gallons (113.6 L) of fuel, two people and test power on board we had a test weight of 3,313 lbs. (1,503 kg). With a 150-hp Evinrude E-TEC turning a 15 5/8 x 13" SSP prop we reached a top speed of 5650 rpm of 34.9 mph. At that speed fuel burn was 15.7 gph giving us a range of 60 miles. She doesn't really have a best planing speed so users can determine for themselves whether they want to go far or fast. With that said, I found her to be most comfortable at 3500 rpm and 20.5 mph. That produced a fuel burn of 6.3 gph which the Sylvan Mirage could keep up for 4 hours and 18 min. and 88 miles. Hole-Shot Wizard. Thanks to the RPT tubes and her 2-stroke Evinrude E-TEC power we reached planing speed in only 2.6 seconds, accelerated through 20 mph in 3.4 seconds and 30 mph in 6.2 seconds. These are remarkable times for what is essentially a twin-toon boat. Handling The 8522 LZ seems to come up on plane from a level attitude thanks to the wings mounted from the sides of the extended engine pod. Engine trim seems to have little to no effect as I noticed no difference in the spray coming from the sides of the boat or in the speed as we cruised along the lake. We put her through a fairly punishing test amid chop generated by 20 mile-an-hour winds. Testing in these kinds of conditions can bring out the worst in a pontoon boat. They can hobby horse or drench the passengers aboard. Happily, the Mirage 8522 performed well. The ride was surprisingly dry and while we did experience some hard bumps, it was nothing more than what was to be expected when running nearly 35 mph into consecutive speed bumps in the face of 20-mph winds. (The apparent wind was 55 mph.) With the two tubes being spaced well apart, I did notice some flexing of the foredeck, but again nothing more than expected on a twin-tube design. When turning I noticed that she tends to lean to the outside of the turns roughly 4 ½- degrees. 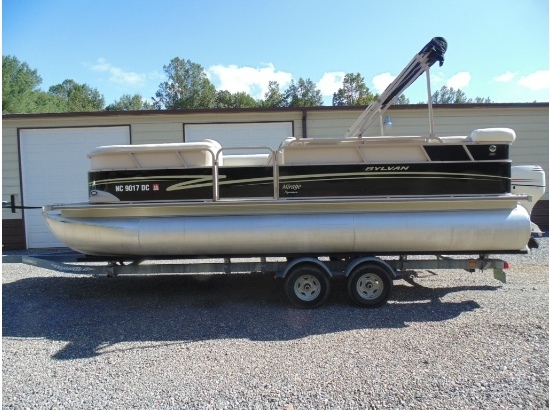 This is the nature of virtually all twin-toon pontoon boats, and the Mirage 8522 LZ is no exception. FYI -- catamaran powerboats do the same thing, and it is just the nature of the design. The Comfort Factor. As noted above, the RPT hulls are not round, but rather have a 20-degree deadrise. Just as in monohulls, where a 20 to 24-degree deadrise is molded into the bottom to make the boat more comfortable at high speed in a wicked chop, so, too, does the Mirage 8522 LZ have a 20-degree deadrise in each of its toons for the same reason. And while I have no gauge to measure it, the seat of pants tells me that this boat was more comfortable barreling through the chop than conventional twin toons. For years we have tried getting video on all sorts of boats in choppy conditions, but the camera is all over the place and no one could watch the video, nor would it mean anything. That's why we shoot in flat water, as we did for this test in the lee of a peninsula. When it comes to ride, readers will just have to take my word for it. While this may look like a turn to starboard it is actually a turn to port and it shows how the Sylvan Mirage has a slight lean to the outboard side of the turn. This is something virtually all twin toons do. Here’s another view of the outboard turning characteristic. This was shot during a turn to starboard. Features Walkthrough Forward Deck A boarding gate at the bow leads to roomy bow seating that features three admiral’s chairs to the port side and a wraparound lounge to the starboard side just ahead of the helm. One of the two pedestal bases for the single standard pedestal table is mounted in the center of the foredeck. All seating is as comfortable as I've ever felt on any pontoon boat and the admiral’s chairs swivel and recline. An insulated cooler with drink holders lies between the two forward seats. It’s hard to picture a more welcoming gathering area in the bow of the Sylvan Mirage. Stainless steel speaker grills and drink holders are nestled into the seatback. Storage is under the seats and under the chaise seatback ensuring that all usable space has a purpose. Helm The helm of the Sylvan Mirage is an excellent example of elegant simplicity. The console is a beige tone to reduce glare and faux wood panels are recessed into tan vinyl. White-faced gauges with chrome bezels are to either side of the leather wrapped three-spoke wheel. A door to the side of the helm console allows access to the storage beneath. Directly across the helm is a portside boarding gate. The helm is in close proximity to both the fore and aft gathering areas keeping the captain in the center of the conversation. The faux wood panels have a classy look and white gauges with chrome bezels provide an eye-catching contrast. Always with pontoon boats the control is at nearly a 45-degree angle... even here, when a separate mounting point is molded into the console. The lower panel curves around the inside of the console and Sylvan created an MP3 holder next to the jack and 12V power outlet. Stern The stern of our test boat featured wraparound seating with three of the seats having drink holders embedded into the seatbacks. The seats to both sides also had stainless steel grilles mounted to the speakers. The forward ends of the seats are 2’ 4 ½” (.71m) across and the seats themselves are 3'5" (1.05 m) across. The corner seats had a battery to one side and a steering pump underneath the cushion to the other side. The remaining seats all have the usual accommodations for storage underneath. Yet another admiral’s chair lies across from the helm allowing the same vantage point that the captain enjoys. The center stern seat is removable allowing access to the aft boarding gate. Notice the optional teak-grain vinyl decking. The reboarding ladder is to starboard and the hinge point is nearly at the water level. The center-aft seat is removable allowing access to the stern gate and the swim platform. The seat can also be relocated to the bow to increase the seating in that area. The swim platform on our test boat was covered with the optional teak grain vinyl flooring. A reboarding ladder was secured to the starboard side but with its hinge point being so low to the water I found it difficult to retract from the deployed position. The Bimini support is made from BB square channel and the all-around nav light is mounted to the top. Observations My overall impression of the Sylvan Mirage is that she presents a very comfortable and functional entertaining platform with versatile seating that is among the most comfortable on any pontoon boat I have ever tested. By putting four admiral's seats on the Mirage 8522, everyone can be a grand pooh bah at least for some of the cruise. Don't snicker -- it's a great feeling and guests will love it. Her handling characteristics and hole shot times also make her an excellent watersports platform so feel free to bring the kids along on the next waterborne adventure. With a time to plane even oldsters will be able to get up on skis without much trouble. And that, together with her comfortable ride are this boat's strong suits. For those looking for even faster WOT speeds we suggest consideration of one of Sylvan's tri-toon hulls. Tri-toons are generally faster than twin toons. The Mirage 8522 is somewhat in the middle because of its centerline RPT engine pod that undoubtedly aids her time to plane and top speed of 34.9 mph top speed. Sylvan Mirage 8522 LZ (2013-) Test Result HighlightsTop speed for the Sylvan Mirage 8522 LZ (2013-) is 34.9 mph (56.2 kph), burning 15.70 gallons per hour (gph) or 59.42 liters per hour (lph). Best cruise for the Sylvan Mirage 8522 LZ (2013-) is 16.4 mph (26.4 kph), and the boat gets 3.89 miles per gallon (mpg) or 1.65 kilometers per liter (kpl), giving the boat a cruising range of 105 miles (168.98 kilometers). Tested power is 1 x 150-hp Evinrude E-TEC.For complete test results including fuel consumption, range and sound levels go to our Test Results section. Standard and Optional EquipmentSylvan Mirage 8522 LZ (2013-) Standard and Optional EquipmentSystems CD StereoWashdown: Fresh WaterExterior Features Carpet: CockpitOutlet: 12-Volt AccSwim LadderSwim PlatformCanvas Bimini TopCamper BackFull Canvas = Standard = OptionalSylvan Mirage 8522 LZ (2013-) WarrantySylvan Mirage 8522 LZ (2013-) Warranty InformationWarranties change from time to time. While BoatTEST.com has tried to ensure the most up-to-date warranty offered by each builder, it does not guarantee the accuracies of the information presented below. Please check with the boat builder or your local dealer before you buy any boat.Hull Warranty Years Limited lifetimeDeck Warranty YearsLimited lifetime Sylvan Mirage 8522 LZ (2013-) PriceSylvan Mirage 8522 LZ (2013-) PricePricing Range$19,998.00 - $59,998.00Prices, features, designs, and equipment are subject to change. Please see your local dealer or visit the builder's website for the latest information available on this boat model. $24500 CALL US TOLL-FREE 1-(888)-529-2655 Clean Title Terms & ConditionsThe winning bidder must respond within 3 days after the auction with a $1,000 deposit required via wire transfer, Visa/MC, or certified funds (cashier's check) to start transaction. Then, the buyer has 3 days from the receipt of the deposit to do his/her inspections and due diligence. After the 6 days following the closing day of the auction, if the buyer has not completed his/her inspections and due diligence, it will be understood that the vehicle will be taken as an AS IS without the inspection by the buyer. If the above items are not met within the allotted time frame, the vehicle may and will be available to all other buyers on a first come first serve basis. In a nutshell, the deal must be consummated within 6 days from the closing day of the auction. Please notify us for any exceptions. The buyer is responsible for all shipping costs. We will arrange for shipping, if requested. Also, the transportation to and from the airport and our location is buyer's responsibility. Please understand that the vehicles are Pre-Owned vehicles and at times, the vehicles may come without accessories such as extra keys, cd magazines, navigation discs, floormats, tools, and owner's manuals. Please call for the exact accessories included for the vehicle. The vehicles in the auction are pre-owned vehicles and they are sold as AS IS condition. However, most vehicles may still be in factory warranty or an extended warranty may be purchased. Ask for details. Seller reserves the right to end the auction early without any liability to the seller.